I have a space heater that has stopped working correctly. I replace the mother board and it works the same. The fans come on but it doesn't fire up. I looked at the spark plug thing and it looks like new condition. Whats parts do I throw at it ? It used to make a ticking sound as it was firing the gas but that noise has stopped. Is it gas, and does it have a thermocouple? Ticking noise that isn't there any more might be a bad igniter?? Pressure switch is probably not closing. Ticking is electronic spark. Bypass the safety loop to see if it starts ticking again (safety loop includes exhaust fan sensor, high heat sensors etc). If ticks then sensor is bad. If not then igniter or control board. Safety switch on door cover? 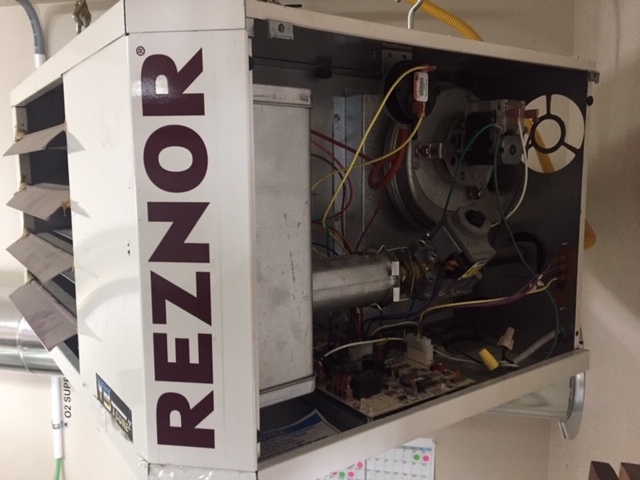 Reznor has wire diagrams with # off machine. Does the flex hose have a anti leak "valve" similar to 20 # L.P. tanks??? missed a ground strap or wire needed for High voltage initiator? Check induced draft fan is actually blowing that right amount of air.--damaged/blocked squirrel cage fan? dead bugs in gas valves? plugged "dope" screen on gas valve. Replace /check 24 volt transformer and or hot wire t-stat to always on? Last edited by Fouthgeneration; 04-09-2019 at 06:12 PM.